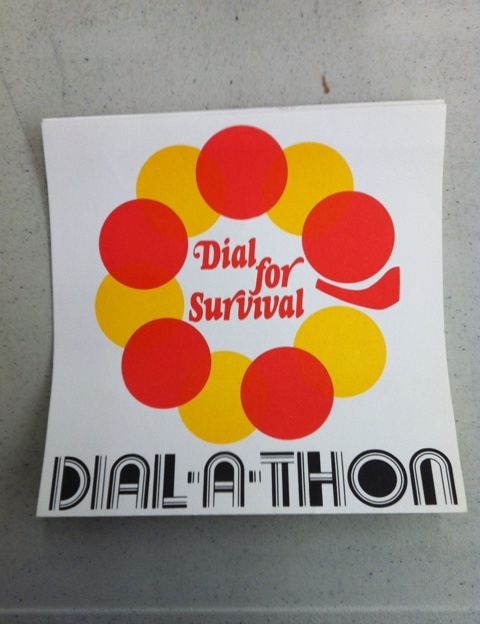 We found no Thanksgiving greeting to share on the blog this week, but the pamphlet described below should make us all very thankful that we are not currently dealing with a drug crisis like the one that surfaced in the 1960s and 1970s. Federation faced the drug crisis head on, of course, with support for their clientele at community centers, support for staff throughout the Federation agencies, and in training and education. 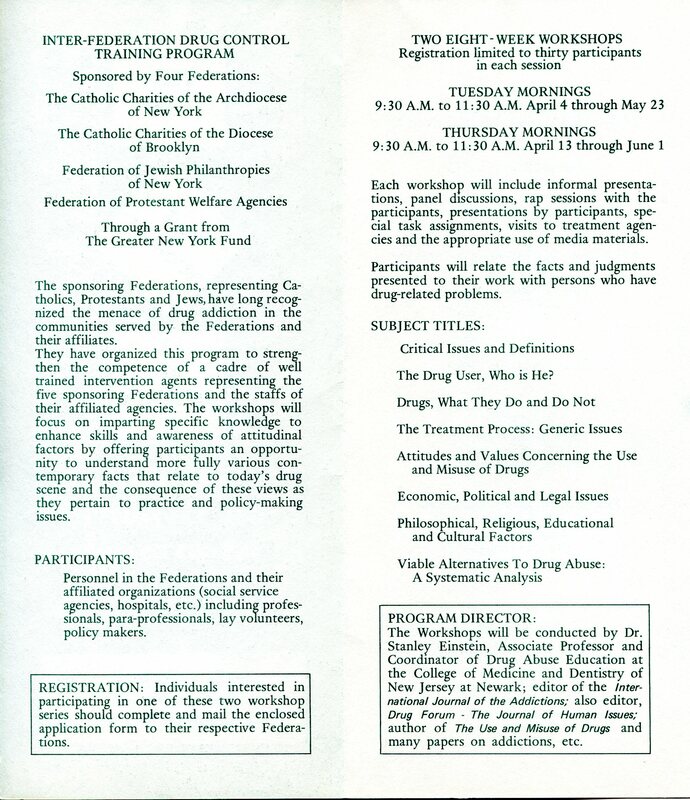 This pamphlet describes an eight-week training workshop held in 1973 by and for “the Federations and the Staffs of their affiliated agencies” – meaning, the Catholic Charities of both Brooklyn and New York and the Federation of Protestant Welfare Agencies, as well as the Federation of Jewish Philanthropies. They pooled their resources and worked together through these workshops to “strengthen the competence of a cadre of well-trained intervention agents representing the … sponsoring Federations”. Funded with a grant from the Greater New York Fund (now the United Way of New York), the participants were personnel in the Federations and their affiliated social service organizations, including professionals, para-professionals, lay volunteers and policy makers. The program director was Dr. Stanley Einstein, Associate Professor and Coordinator of Drug Abuse Education at the College of Medicine and Dentistry of New Jersey. 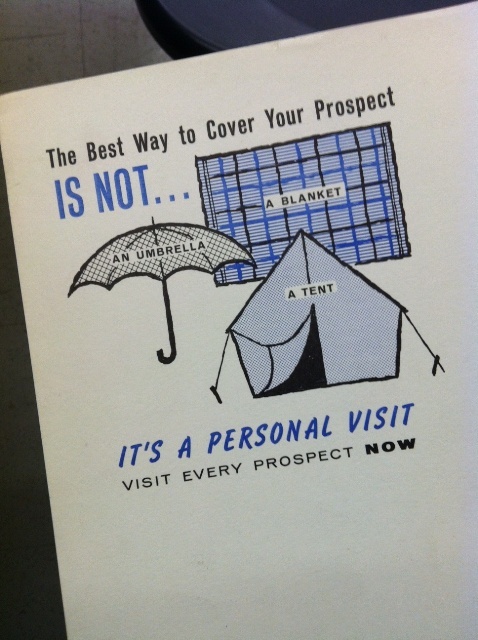 The contact at FJP was Herman L. Sainer. 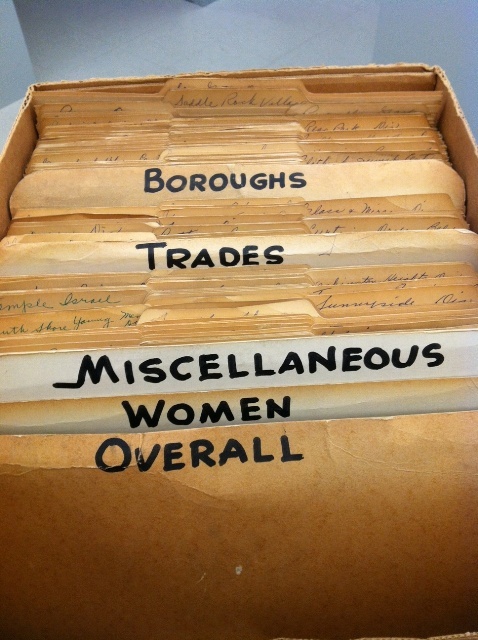 A series of folders documenting the work of the committee that undertook the planning and running of these workshops can be found in the FJP subgroup, the community services division, the Family, Children’s, Vocational and Rehabilitation department, the files of Saul Hofstein, consultant. Although the workshops took place in the spring, I find this example of inter-denominational collegiality to be a fitting example of how to work together to ease a community’s problems in the season of Thanksgiving. Federation of Jewish Philanthropies had a Public Relations department, which handled all sorts of publicity and communications concerns for FJP as well as FJP’s affiliated agencies and subventions. 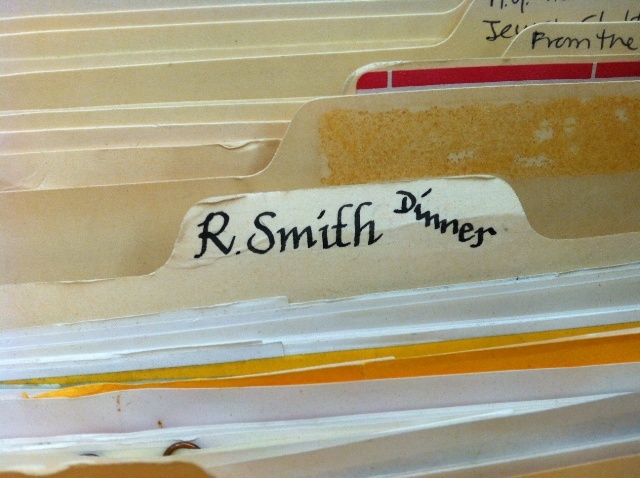 Robert I. Smith, who was hired by FJP in 1945 and retired from UFJC in the early 1980s, was perhaps the most prominent Public Relations Director the agency ever had, both in terms of the volume of archival material he generated and in the impact of his tenure upon the organization. Over the course of his career, Mr. Smith (seen below and definitely not to be confused with this Robert Smith) gathered many materials relating to the history of Federation. These historical materials saw heavy reference use by his department and they comprise a portion of the FJP Public Relations series. Other materials in this series include: press releases, annual reports, biographies, newspaper clippings, brochures, printed materials, event invitation samples, PR directors’ papers, dramatic scripts for radio and television programs, photographs, and logo art. This summer I processed all of the non-photographic FJP PR materials. The series is rather unlike the rest of the collection in that it documents the creative work of the PR department and includes a high percentage of visual materials. Expect more to come soon from the PR series here on This Can Go Back to the Archives. In the meantime, the images below offer just a taste of the variety found in this series. 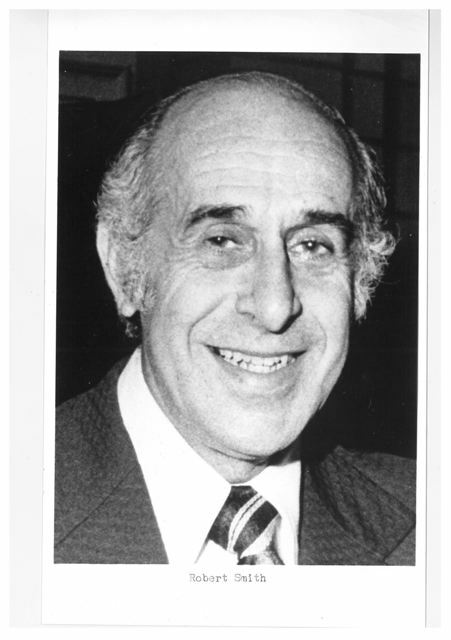 A longtime staff member in the Executive Division and Community Support Division of Federation was Milton (“Mickey”) D. Levine. He was hired at Federation sometime around 1951 and worked there for more than 25 years in a variety of departments. Because of his experience and ability to get things done he was pulled in a lot of directions and often was responsible for many departments and committees at one time. 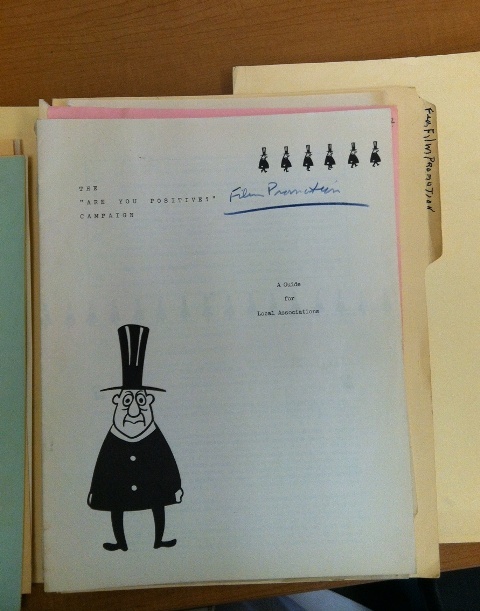 At this point in our processing, there are Mickey Levine files from his years as Executive Secretary of the Board Committee on Social Legislation, c1951 to 1977; as manager or director of the Legacy program in the Community Support Department, 1972-to at least 1973; and in a file of correspondence 1969-1972, with Martha Selig in Community Services no doubt as one of her liaisons to the Executive office. By the early 1970s, Levine was working with Edward R. Vajda, then Executive Director of Community Support. 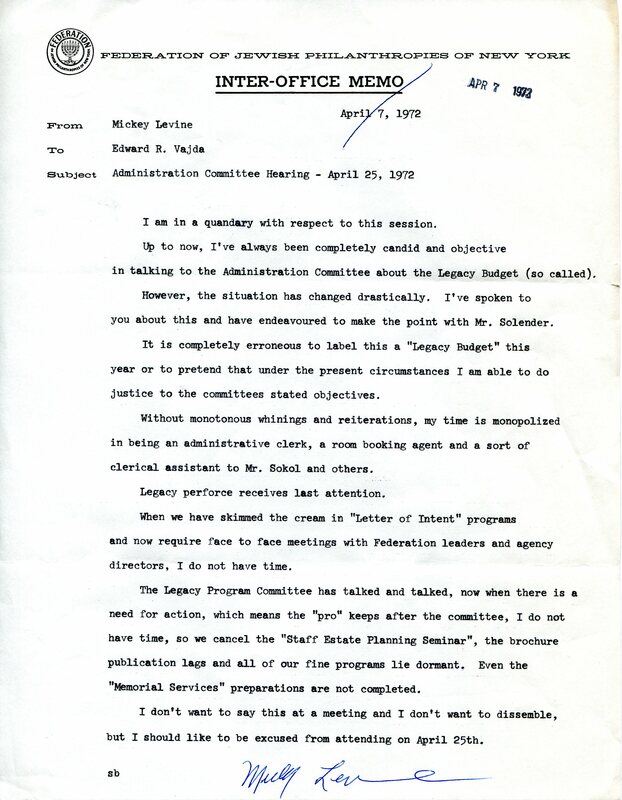 In the spring of 1972, in attempting to put together a budget for the Board’s Administration Committee on the Legacy Department, he wrote instead a memo to Vajda lamenting his lack of time for all he was responsible for and his inability to do actual work on Legacies. The primary problem was the time it took for clerical administrative responsibilities and to manage Board committees and members, and how much time that took away from his more important work with the Legacy Department. The Federation of Jewish Philanthropies subgroup contains the files from the Community Services division, and as part of the division, a number of staff members known as Associates from approximately 1977-1982. Linda Feigenbaum (she became Linda Storfer in the summer of 1979) was the Government and Community Relations Associate during many or all of those years, and 6 bankers’ boxes of her files are being processed this month. They fall into 2 sub-subseries: Jewish Community Centers and General Subjects. 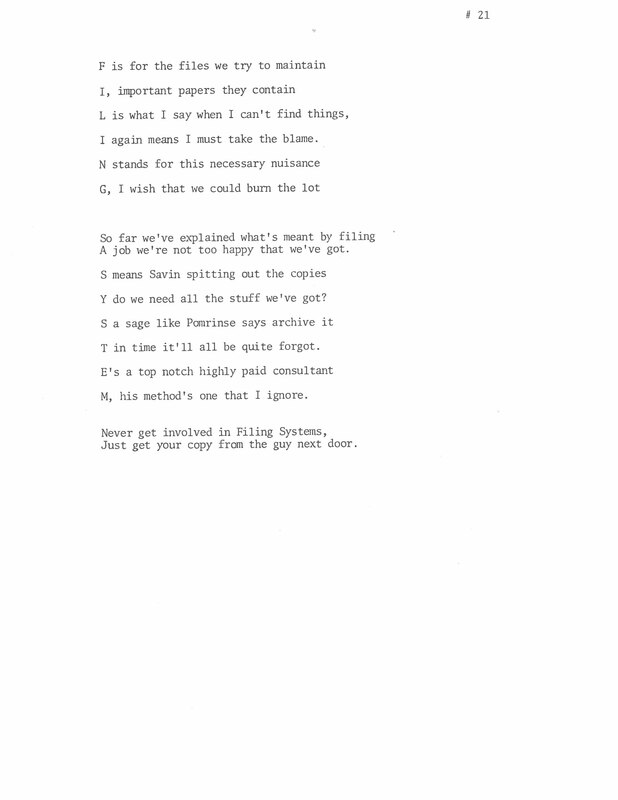 Within the subject files, she has the usual subject headings of other staff members’ names, committee names and associations that she communicated with in the course of her work with Government and Community Relations matters but most files relate to Federation’s Community Relations issues. 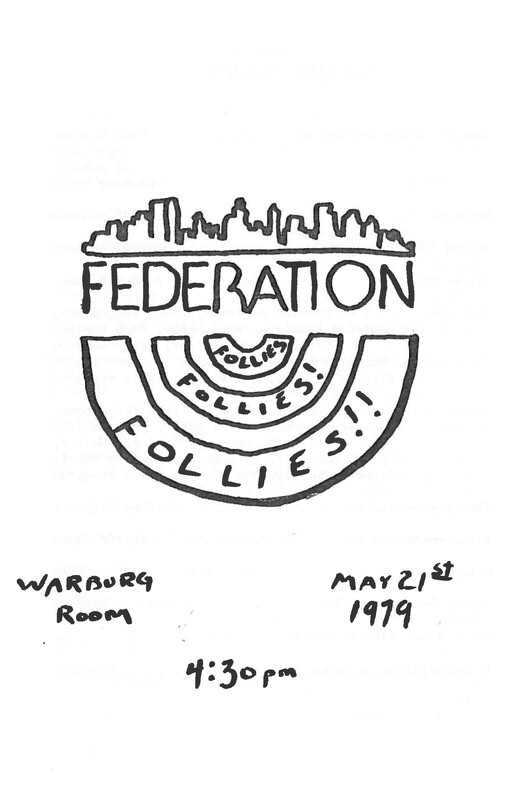 On May 21, 1979 at 4:30 pm in the Warburg Room of Federation headquarters, a room usually associated with serious Distribution Committee meetings, about 20 staff members participated in the Federation Follies.